Hyundai started using TPMS in 2006 on the Hyundai Accent, Tucson and Veracruz. The carmaker equipped its other vehicles with TPMS starting in 2007. Hyundai has used several different suppliers for its TPMS systems, including Continental, Lear, Siemens and TRW. Each of these systems operate similarly but they do have slight variations. Make sure to check vehicle information and TSBs for specific variations. 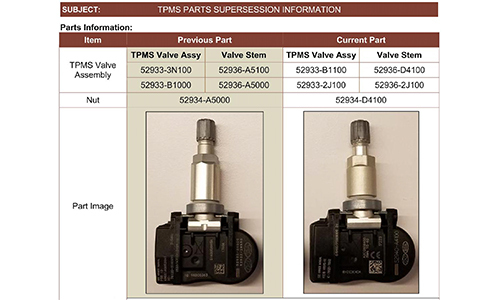 Hyundai TPMS has an auto relearn function, but if a shop is initializing a sensor or doing a manual relearn, you will need a TPMS tool that can capture the sensor IDs and program them into the TPMS module. 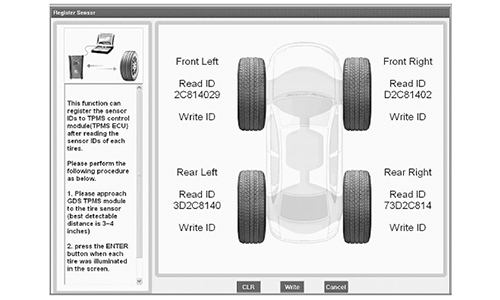 Since Hyundai TPMS systems have an auto relearn, shops do not have to perform a relearn procedure following a tire rotation. The receiver will complete the relearn procedure after the vehicle is driven up to 20 minutes at speeds over 12 mph. Later systems require only 10 minutes at 15 mph. Check the service information for the specific speeds and times for the relearn procedure. Corrected tire inflation pressure will cause the TPMS indicator to shut off once the tire pressure sensor reports to the TPMS receiver, approximately 20 minutes after the vehicle stops moving, or after 20 minutes of continuous driving. If a TPMS wheel sensor is replaced or the TPMS module is replaced, you will need a TPMS tool that can collect the sensor IDs and program them to the TPMS module via the OBDII port. Hyundai recommends not performing initialization or reprogramming if the vehicle is parked on a metal floor, roof, or even on an alignment rack or lift. The metal will transfer the RF signals, which can cause the learn procedure to fail and set DTCs. External electronic devices connected to the vehicle’s power outlets such as a computer, seat warmer, massager, phone charger, etc. may also cause this condition. In some cases where a sensor has failed, a system might pick up a sensor ID from another vehicle if it is driven nearby and has a similar sensor. If a TPMS malfunction is caused by radio interference, a malfunction indicator lamp will illuminate and the trouble codes C1312-C1315 may be triggered. The TPMS malfunction indicator light will generally turn off if the sensor is removed from such interference. If the system is a TWR TPMS, the light will turn off after the vehicle is moved away from the interference and the ignition switch is turned on and off. At the end of July 2018, Hyundai issued a new TSB indicating that the Continental TPMS sensors on the following models have changed: Genesis G80 (DH), Accent (RB), Sante Fe (NC), Santa Fe Sport (AN), Equus, Genesis Coupe (BK), Sonata (YF), Sonata Hybrid (YF HEV), Elantra GT (GD) and Genesis sedan (DH). The new TPMS sensors have a shorter valve stem and the nut is shorter with a matte finish. However, the previous and current parts are interchangeable.